I will NEVER be nervous again and I can say that hand on heart. Everything was explained to me and Dr Paul took such good and gentle care of me. I'm back again in 2 weeks and I am looking forward to my pampering again. One of the most common reasons patients decide not to make that initial call to make an appointment is due to simple anxiety and fear. Some patients may have had a bad experience in their early childhood years or simply may just have an overall general fear of dental visits. Some patients may have a sensitive gag reflex or trouble holding their mouths open for a certain amount of time. This can result in a complete avoidance of dental visits causing prolonged dental problems that can cause abscesses or worse still tooth loss. At Dublin 18 Dental Rooms we understand completely your fears and anxiety. From our care team on reception to our dental team we will help you address and overcome these anxieties. We understand exactly how real these fears are for our patients. It is a common problem for people so don't feel alone. With oral sedation our team can put your dental phobias at rest. Our patients can receive their dental treatment in a greater degree of comfort and reassurance. If you have avoided dental care due to anxiety call us at Dublin 18 Dental Rooms. We can carry out a full detailed consultation with treatment planning and explain your sedation options. Once you are a suitable candidate for sedation after reviewing your comprehensive medical history we will select an oral sedation that fits your requirements best. Sedation has helped patients thousands of throughout the years at our clinic from routine dental treatment to cosmetic procedures. Dublin 18 Dental Rooms has gained a welcome reputation in helping a large amount of people with dental phobias and anxieties. From the moment you make that initial call to our practice our caring and re assuring team will answer any questions you may have to put you at your ease. We were delighted to have been awarded with a whats clinic customer service award as we strive to ensure every single patient feels both valued and cared for at our practice. We have a highly qualified and skilled set of like-minded professional individuals who share the same common goal of providing the best dental treatment available today in a relaxed, tranquil and caring environment. Our practice surroundings themselves offer our patients a quiet oasis whether you are receiving dental treatment or facial aesthetics treatment, your journey with us will be unique from other dental practices. From our friendly team to greet you on your arrival offering you fresh teas and coffees to our personal care team taking you through your treatment step by step we know you will find this a unique relaxed dental experience. 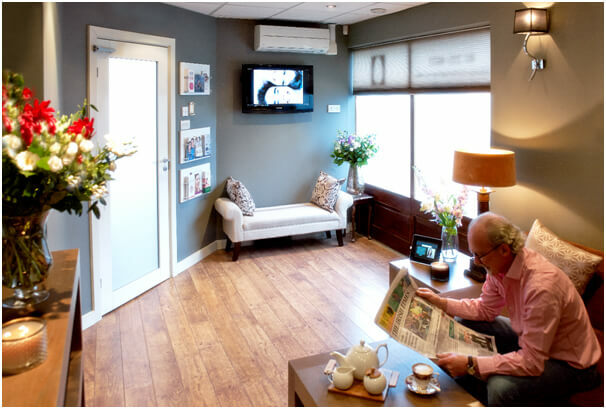 At Dublin 18 dental rooms we are known for our approachable and caring nature. We understand how important it is for our patients to understand all their treatment needs to help them to alleviate unwanted fear.